You are currently browsing the tag archive for the ‘Ruth Lawrence’ tag. Clown development can be difficult, can you speak to that? ST – There’s a lot of different types of clown training and approaches to what ‘is’ a clown. I’m trained in Pochinko Clown Through Mask and the process begins with mask work using your own mask, then transference to a clown nose and potentially into a non-nose, Joey clown. We’re not in red noses for this show. These are sophisticated, adult clowns, not as innocent or as bumbling as the red nose variety, with a much larger vocabulary than your standard circus clown. You wear the mask and let it move you, then take that energy and keep it going when the mask comes off. This way, you allow your character to take the lead organically. We follow impulse in rehearsal and let it dictate how to create the show. How do you turn your clown on? ST – It comes from the mask. We spent a two weeks in January working with masks and taking that physical exploration; now we’re comfortable experimenting within these clowns and can find their full range of emotions and tics. There’s no need to have the nose if you are intent – we’re using headgear like swim caps as a character anchor. Who is in the cast and how did they come together? ST – The cast is my dream team and I’m glad they were all able to do it! Susan Kent is playing the director (Herr) and Ruth Lawrence is the star actress (Prima). Lois Brown is the old-school feminist theatremaker and visual artist and writer Craig Francis Power, in his first onstage role, as the lighting operator (Noseworthy). I play Squirrel, the stage manager, who is thrust into the show after Janice has an accident with her curling iron. How have they all done getting into the world of clowning? ST – This has been an amazing group to work with and I thank my lucky stars that I have such open, talented artists. They’re all naturals and it’s been a belly laugh and a half leading them through the clown work and watching these characters come into their own. Who else is involved behind the scenes? ST – I’m designing the set, costumes and props; Sean Panting is designing sound, Jamie Skidmore is designing lights and Craig Francis Power is doing the projection design. How much of a history lesson will the show be? LB – I think there is a fair bit of history there – but because Sara is showing us how we bend history for political reasons. ST – Well, most of the ‘facts’ are true. The truth was, in most cases, funnier or more bizarre than anything I could think of. It’s how we mess with the facts that make it a questionable lesson. More like a weird and hilarious dream involving a lot of historical detail. I think more than anything you might be tempted to look a few things up later to see if we made them up. What’s the overall concept and storyline of the show? LB – Legendary feminist theatre artist Janice pokes herself in the eye with a red-hot curling iron minutes before showtime on opening night and dies. Marco is debilitated after being trapped under the Death on the Ice set. Noseworthy is stoned. And Squirrel the stage manager turned actress is so scared that she pisses herself several times during the opening number. That leaves the director, Herr who is in love with her star, Prima. They say show must go on. How will the Estro-collective do it? 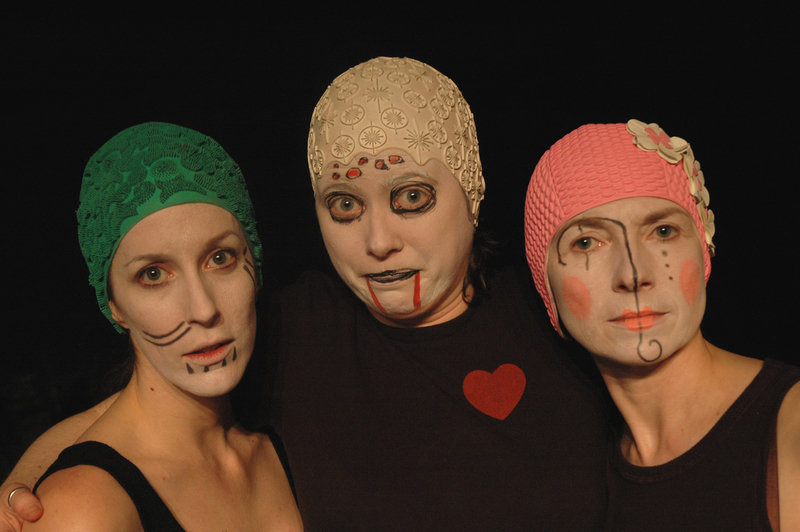 It’s a show that not only satirizes Newfoundland history and feminism – it satirizes itself. It takes the notions of patriarchy, feminism, Newfoundland history and the way we tell it and mocks it all. It’s irreverent. Takes the piss out of everything, really. The show runs March 24 – 26th at the Majestic Theatre in St. John’s, check out www.shesaidyestheatre.ca for more information. With more then a dozen of the arts scene’s finest fused together, hailing from a variety of disciplines, newfoundlandartistx (N.A.X.) created one of the most entertaining nights of original theatre to be experienced in St. John’s in a while. Part way through the show the realization came that it was already one of those memorable shows you feel you can relive in your head whenever you’d like. 5 Very Short New Plays in a Tub lived up to its name, both literal and critical. Lois Brown is the Artistic Director of N.A.X. and also one of the four writers that came together to make the production come to life. Brown was joined by all-stars Robert Chafe, Mary Walsh, and Lynn Panting to ink the words for Sue Kent, Philip Winters, Dave Sullivan, Ruth Lawrence, Kira Sheppard, and Aiden Flynn (in order of appearance). As the name of the series suggests, every one of the five shorts took place in the bathroom, either immediately or eventually incorporating the luxurious spa tub full of water into the scene. Gloria written by Chafe and directed by Brown featured a stunning performance by Kent who started the scene “a little over dressed for the tub” in an ardent red dress. Opposite her was Winters who shared a rather implied in-depth conversation to ensure Gloria was “ok,” leaving a guessing audience to try and sleuth out the situation. All the while, Winters’ character was left struggling with trying to deflect and lighten her mood with short comedic quips. Because they couldn’t have bubbles in the tub for the opening number, the first of four somewhat lengthily scene changes started. Although the first was the longest, the crew executed a stellar distraction and got some willing audience members out of their seats and up to their elbows to shake up the suds. Up next was Walsh’s contribution as directed by Amy House called Introducing Romanticism, which abrasively shattered the more somber tone of the prior scene. It featured a ‘present’ and ‘past’ setup with Lawrence in the tub recounting a confrontation. She had signature Walsh sarcasm in her lines which offered relief from the loud and drunken memory being played out behind her. Impressive was that with little eye contact Lawrence delivered lines in sync with her character’s younger-self portrayed by Sheppard. The ‘very short’ short that probably had the most meat on its bones was Leona and Ruth written by Brown, directed by Roger Maunder. It told a story that left an audience wanting more. More back story and a deeper background of how Leona had come to share this conversation over, her caregiver, Ruth’s bath. It recalled childhood memories with Leona now telling stories to Ruth while parting the bubbles and dropping a homemade and quite symbolic raft made of popsicle sticks into the tub. Both of the last two shorts could have served as the final piece in the line up. Whichever one was chosen, however, would drastically effect the audience’s final impressions. Two Witnesses which was written by Panting and directed by Nicole Rousseau featured a take on the apocalypse and opposing emotional approaches. Sullivan’s skittish character appeared with Lawrence’s more accepting and go-with-the-flow nature. She was prepared and ready for the end, in the tub (conceivably to stay warmer) with a party dress on and offered Sullivan his top hat with invitation to join her. Death Would Be a Relief completed the evening and featured Flynn’s only appearance with Kent’s fourth for the night and Sullivan for his third. This, serving as the final piece, allowed the audience to leave with an amusing and charming scene that eventually went over the top. It worked though once the satiric observational comedy had enough time to compound upon itself. It was an incredibly satisfying way to spend an evening with bite-sized pieces that were easy to digest and didn’t convolute themselves. It was easy to leave not only with a new play to revisit in my imagination but also plenty of great personal bath time memories revisited. The show made me realize how pensive and memorable that place can be. In fact I’d always said it was where I went to clear my head but perhaps all this time I’ve just been organizing it better and filling it up with more thoughts.